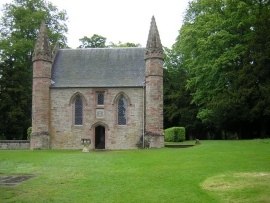 "Chapel Scone Palace , Perth - geograph.org.uk - 452978" by rob bishop - From geograph.org.uk. 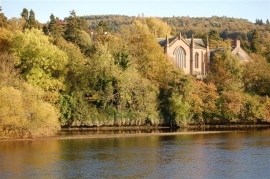 "Kinnoull Church - geograph.org.uk - 589766" by Paul McIlroy - From geograph.org.uk. "Millais Viewpoint - geograph.org.uk - 128570" by Lis Burke - From geograph.org.uk. "Perth - Balhousie Castle" by Roger Wollstadt from Sarasota, Florida - Perth - Balhousie Castle. "PerthStJohnStreet" by Original uploader was BanRay at en.wikipedia - Transferred from en.wikipedia; transferred to Commons by User:Jonathan Oldenbuck using CommonsHelper. "Tay Street from Queen's Bridge - geograph.org.uk - 1542524" by Rob Burke - From geograph.org.uk. Bordered by Argus, Argyll, Fife, Inverness-shire and Stirling, Perth is completely land locked. 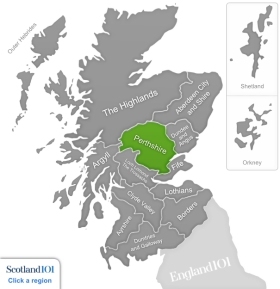 It is known as the Big County because of its range of landscapes – spanning from the rich agricultural straths in the east, to the peaks of the southern Highlands. A trip to the Perth Theatre will transport you back to the Edwardian era, with the dated auditorium contrasting with the contemporary front of house. You will experience all of the glamour of times past but the convenience of present day. Offering a variety of shows that are ever changing, you can expect shows like Abbamania or a revamped version of Cinderella complete with pop songs and humour, as well as the annual Americana festival. If this isn’t your cup of tea, the Perth Concert Hall offers a more modern experience. 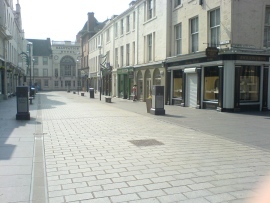 Found in the historic Horsecross area of Perth’s city centre, it hosts a diverse programme of concerts, community events and stage performances. 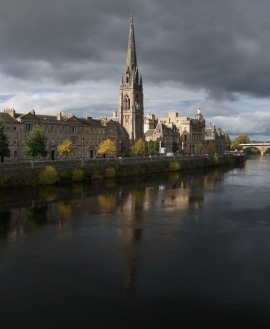 Artists have found inspiration along the River Tay for years, so it makes it fitting that the Perth Museum and Art Gallery is located here. The exhibits here are constantly rotating in order to stay fresh and exciting, while also housing one of the oldest museum collections in the UK. Touring exhibitions such as ARTIST ROOMS are welcomed here and an annual programme of events is offered. 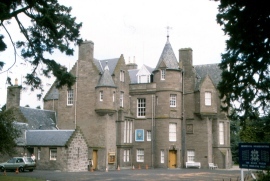 The oldest secular building in Perth is now the Royal Scottish Geographical Society (RSGS) Fair Maid’s House Visitor and Education Centre. The interesting exhibits tell stories of explorers, as well as offering tidbits of information on places yet to be visited. In the Earth Room you can see the continents evolve and learn about the hottest and coldest places on Earth; and in the Explorer’s Room prepare to be memorized as the maps evolve from old to new right before your eyes. Scone Castle was the crowning castle of 42 Kings of Scots and Scotland, including Macbeth and Robert the Bruce. 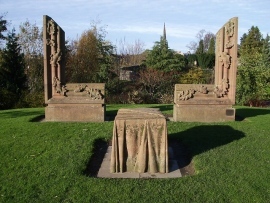 They were crowned or enthroned on the Stone of Scone. The present day sees it being occupied by the Earls of Mansfield, and the vast rooms are filled with intricate tapestries and painting and houses extensive porcelain collection. It shouldn’t come as a surprise that the scones in the café are said to be absolutely delicious! Another castle worth noting is Elcho Castle. One of the country’s best-preserved 16th century tower houses, it was built during the Protestant Reformation in 1560.